Ordered this as a Christmas gift for my wife. The delivery was quick, order updates were first class and the packaging was spot on. 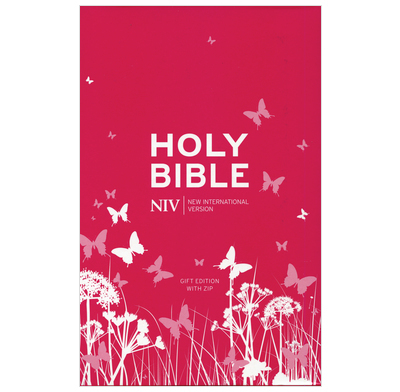 My wife loves thIs bible, its funky pink with a zip and has useful notes in the front. I would recommend, and will be ordering again from this brilliant website. Thanks. I ordered this Bible in a rush for a friend - I put the order in at 1.30 on the Tuesday, paid for first class post, and it arrived the next day so I was thrilled. The Bible is just what I wanted, It's good that it's got a short Bible guide and a few interesting notes included. It came boxed so makes a lovely gift. I will certain use Good Book Company again. Despite the Bible not arriving at first, I contacted the team, and another copy was sent to me immediately. This second copy arrived very quickly. I am grateful for the excellent customer service, who offered money back, and another copy if necessary. The Bible is beautiful! My favourite colour, and really good quality leather. I like the new version of the NIV, and the commentary is helpful. Really good value for money too. Thank you Good Book Company! Highly recommended.